Israeli forces, on Tuesday, closed the western entrance to Ras Karkar village, northwest of Ramallah, occupied West Bank, with an iron swing barrier. 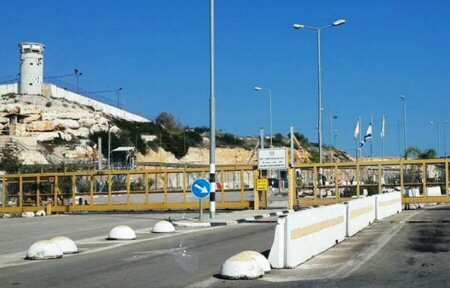 Eyewitnesses told Quds Press that an Israeli truck arrived at the western entrance of Ras Karkar carrying concrete blocks, to use them as bases for the road barrier. They added that Israeli soldiers, with the help of a vehicle-mounted crane, worked on setting up the barrier at the western entrance, which connects the village with the main road leading to Ramallah city and other nearby villages. The army also closed off the eastern entrance to the same village with concrete blocks. This entrance leads to the nearby village of al-Janiya. Such road closures will isolate about 4,000 local residents of al-Janiya and Ras Karkar from Ramallah city and prevent students from going to their schools and universities and employees from going to their workplaces. Recently, the Israeli military gave over Palestinian-owned tracts of land in Jabal al-Raysan, west of Ras Karkar, to Jewish settlers after preventing local farmers from nearby villages from cultivating them.